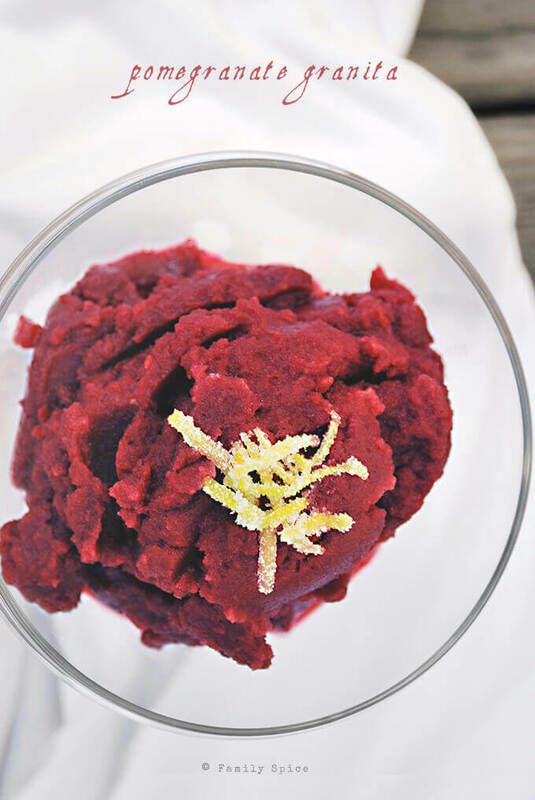 Whether you like it coarse (made by hand) or more smooth (made by machine), this pomegranate granita is a delicious and refreshing treat for everyone to enjoy! To say my family loves pomegranates is quite an understatement. We absolutely adore them and eat them in every way possible and as much as possible. When friends have extra pomegranates from their trees, they invite us to pick the tree clean. This has become a ritual for us every fall, when pomegranate season is at its peak. 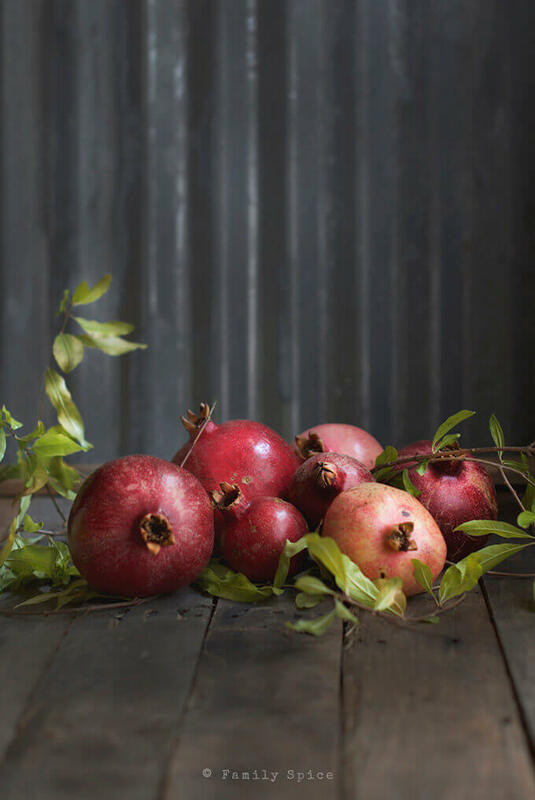 We don’t just love eating pomegranates in recipes, but we eat them straight out of the husk. 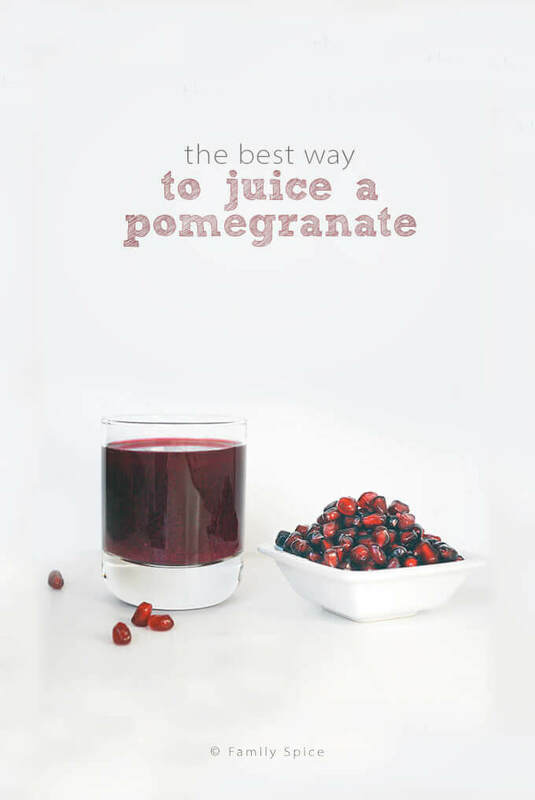 We also love pomegranate juice and have juiced many a pomegranate so we can drink some fresh delicious pomegranate juice. The kids drink it straight up and the hubs and I love it in cocktails. Of course, you don’t have to juice a pomegranate to enjoy pomegranate juice. You can find it quite easily nowadays in the grocery store. 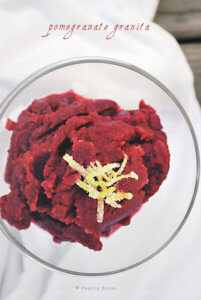 And pomegranate juice takes us to this next recipe for Pomegranate Granita. 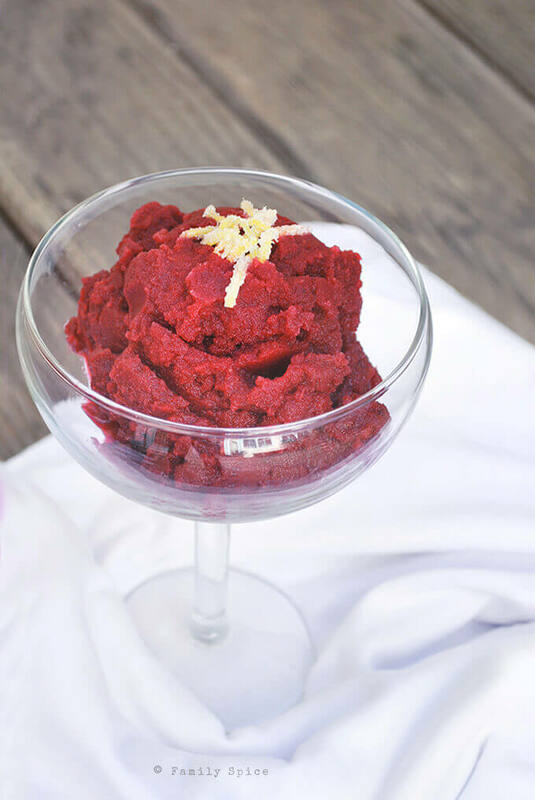 A “granita” is a semi-frozen Italian dessert typically made with fruit juice, also known as “Italian Ice.” Different regions of Italy yields different textures of granita. If you like it coarse, then the best way is to make it by hand. And if you like a smoother granita, then it’s best to use an ice cream machine and stop when you get the texture you like. Pomegranate juice is mixed with a little sugar, lemon juice and lemon zest and the poured into an ice cream machine or in a large bowl, which is put into the freezer for a few hours. Once the pomegranate juice concoction starts to freeze, use a fork to scrape it into large crystals and transfer to serving glasses. A terrific way to beat the heat or just enjoy some delicious pomegranate goodness. Pour into a 9-inch baking dish and carefully place in the freezer. Use a fork to scrape into large crystals and spoon granita into chilled glasses. You can also prepare this in an ice cream machine, which yields a smoother texture (pictured above). Just pour the mixed ingredients into your machine and turn it on. After 15 minutes, you will have your frozen treat ready.